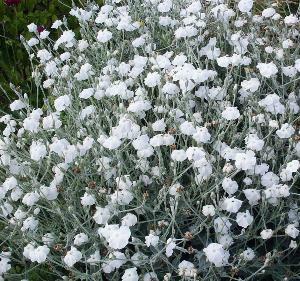 Lychnis coronaria Alba is commonly known as a white flowered Rose Champion. It is a biennial that is deciduous with grey soft hairy leaves. During the Summer it produces branched stems of 3cm wide white flowers. Grows in partial or full shade in a 'well drained' soil. Height 1m, spread 0.5m.